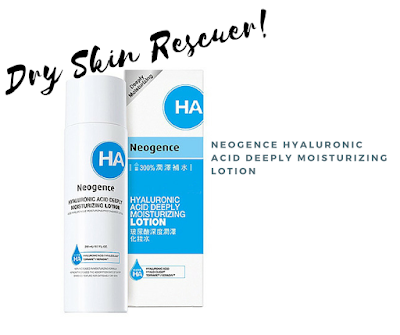 I had reviewed the Neogence Hyaluronic Acid Hydrating Essence in the previous post, This time I'm going to review Neogence Hyaluronic Acid Deeply Moisturizing Lotion. Face lotion on my opinion is basically a moisturizer with a more thin/watery texture than the regular cream moisturizer. Aqua, Glycerin, Propanediol, Aloe Barbadensis Leaf Juice, Glycosyl Trehalose, Jojoba Wax PEG-120 Ester, Hydrogenated Starch Hydrosilate, PEG-40 Hydrogenated Castor Oil, Bis-PEG-18-Methyl Ether Dimethyl Silane, Triethanolamine**, Acrylates/C10-30 Alkyl Acrylate Crosspolymer, Allantoin, Chlorphenesin, Phenoxyethanol, Sodium Hyaluronate, o-Cymen-5-ol, Caprylic/ Capric Triglyceride, Salvia Sclarea Extract, Xanthan Gum, Fragrance, Hyaluronic Acid, Potassium Silylate, Butylene Glycol*, Caprylyl Glycol. I don't hate the simple packaging at all, not impressed, but I can live with the bottle on my vanity display. It is actually a bit humongous, but considering the price (RM80), bigger is certainly better. The lotion is dispense through a regular plastic stopper, and just enough liquid will be dispense in two-three shakes. The texture is quite watery and runnier than the essence. It absorbs into the skin fast after few pats and refreshes the skin. There is no sticky feeling whatsoever and feel so light. I love the lotion more than the essence (although the essence is the award winning product) because of its light texture. It feels like you're working with water and it instantly hydrates you. I don't like the size though because it will be a hassle to travel with. There is more ingredients in the lotion than the essence, and it is not fragrance-free. Although the ingredients listed are not that harmful, there is a chance of breaking out especially with sensitive skin. Overall, I am in love with this lotion and can see myself incorporating this in my routine. Will I repurchase? Maybe... since the price is not that friendly to my unemployed wallet. I agree, it's a big bottle, but forking out RM80 can only be done when I have some extra dough in my wallet! Never heard of this brand before, shall check it out soon! Neogence sound familiar, thank you for the recommendation. Having tried this brand before, if the texture is watery then it must be very moistful! know about this brand before ~ but the price is not cheap.. I will never not be amazed with how many obscure brands they carry! Hope you will like it as well if you give it a try! I hope you'll have good results if you try it later! A beauty consultant recommend me this as well. Thanks for sharing your review. I should really consider to try this. First time heard about this brand!!! Would like to try it out!! definitely my saviour! been longing for this kind of product! thanks for recommending. I have heard of this brand but have not try this product yet. nowadays outside so hot and polluted. good to have products like these..
Never heard this brand before.. Great review... Hopefully can try it out! Nyx In Your Elements Palette Grand Launch in Malaysia and First Look!